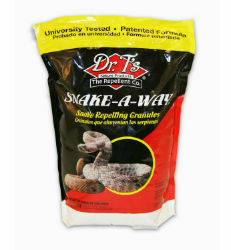 Repel snakes and keep them out with Dr. T’s Snake-A-Way® - the third-party tested solution that repels poisonous and non-poisonous varieties of snakes. Snake-A-Way® is the only snake repellent registered with the Environmental Protection Agency. It will not have effects on humans or the environment when used as directed. The unique blend of sulfur and naphthalene in Snake-A-Way works to temporarily disrupt a snake’s sensory receptors via its Jacobson’s Organ (auxiliary olfactory sense organ). This successfully disorients the snake, causing it to slither away in search of fresh air. Snake-A-Way is long-lasting, and starts to work immediately after application. It’s easy to apply; wearing gloves, spread the granules along the perimeter of the area you want to protect to create a snake barrier. To repel garter snakes, sprinkle Snake-A-Way® in bands 4-5 inches wide, and to repel rattle snakes, sprinkle in bands 8-12 inches wide.